Home Theater PCs, DVRs, TiVos pretty much all enable your TV to “be smarter” by allowing you to time-shift your TV viewing. But what about sports? Read on for a great guest-post by “wayner” outlining one of the more creative and useful HTPC plugins available to SageTV users. NOTE: This is a guest post by wayner. To read more about how to submit your photos and/or write-ups for the GeekTonic Media Gadget Showcase Series, read this. Basic guidelines for writing and submitting a guest post at GeekTonic can be found here. Using PVR software like SageTV to watch sports is a huge productivity enhancer since sports games have so much “dead time”. Zipping through commercials or stoppages in play means that you can watch an entire hockey game in 60 minutes or NBA game in 48 minutes. But if you have PVRed sports for long enough you will come up a situation where the game runs a little bit late, or goes into overtime, and your recording stops causing you to miss the climax of the game. D’oh! There are a couple of ways to try to avoid this – with Sage, like most PVRs, you can “pad” the recording time by adding an extra 15-30 minutes to your recording. But that doesn’t always work, particularly if the game goes well beyond its scheduled time slot which is not unusual for Stanley Cup playoff games. 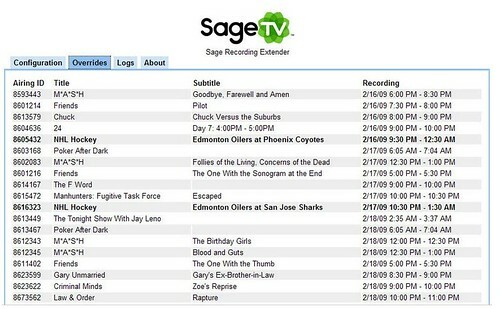 SageTV addin developer Slugger has come up with a much more elegant solution – Sage Recording Extender (SRE). This add in monitors websites such as ESPN.com to determine whether a game is still in progress. If so then it keeps extending the recording until the game ends. SRE monitors your upcoming recordings in SageTV and tries to determine if they are sports games. If they are it then parses out the team names and matches it up with a game on the website. Unfortunately this means that SRE can break when websites change their format. Luckily Slugger is on the ball to make changes when this happens. SRE uses the Jetty webserver for configuration – Jetty is now becoming very widely used for many Sage addins such as Sage Job Queue, Sagealert, Batch Metadata Importer, and an updated version of Nielm’s Sage webserver. SRE also can work in conjunction with Sagealert to send you Tweets, IMs or emails to indicate that SRE is monitoring a recording. SRE is configurable via a web interface but it should work fine with the default settings. With the web interface you can ensure that SRE has recognized sporting events and you can set options such as the maximum extension time in case SRE loses track of an event – this is normally only caused by your internet service going down. Assuming that you properly configure your router you can even access SRE over the internet to check that everything is going well with your system. SRE is a fantastic addition to your SageTV arsenal if you are a sports fan and is highly recommended. The development of such a tool, which I believe is unique to SageTV, shows the creativity of the Sage development community. About wayner: "Wayner resides in Toronto, Canada and is a frequent commenter on GeekTonic. I've gotten to know him from the many hours spent on the SageTV Forums where you'll often find him (under the same online name) Be sure and also check out this guest post outlining Wayner’s media setup.